Starz on Friday lifted the lid on footage for American Gods Season 2, and it's as trippy as you would expect. There's mystical action that makes the drama from American Gods Season 1 look like child's play. Heck, even Shadow Moon asks "Is everyone in here a God?" and it doesn't go down well with those who share the screen with Ricky Whittle. American Gods Season 1 concluded with Shadow Moon learning that Mr. Wednesday (Ian McShane) was Odin, the mystical god of war from Norse mythology. It was a stunning conclusion to a wild freshman run. It's good to know that there's actual footage of the series considering all of the behind the scenes twists and turns that have put the future of the show in doubt. First, Bryn Fuller and Michael Green departed amid creative differences with the network. More recently, Jesse Alexander was ousted from the series following delays and reports that multiple drafts of a script had been rejected by Starz. Watch the teaser below, and hit the comments with your thoughts on it. Has the long wait ruined the momentum for you? 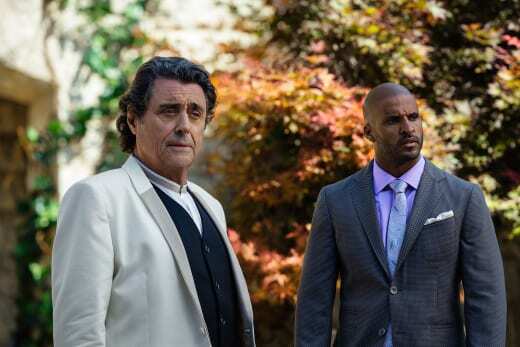 American Gods returns in 2019.